Campaigners shared their concerns about surgery closures and changes affecting family doctors in Brighton and Hove at a packed public meeting. One GP (general practitioner) told the meeting that doctors were facing pressures that were affecting their ability to provide the level of health care that they wanted. Dr Appleby said: “More and more private companies are moving in when a surgery closes. Access to a doctor does not improve as these companies are run for profit not for our need. “They have short contracts with NHS England so all that continuity and relationship with your doctors is gone. There were lots of questions from the audience about the handling of recent Brighton and Hove surgery closures by NHS England. Eaton Place surgery, in Kemp Town, closed earlier this year and Goodwood Court, in Hove, closed in June. 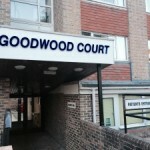 Goodwood Court’s annex at Eaton Place, Hove, has also closed. Some concerns were expressed about moves for the Brighton and Hove Clinical Commissioning Group (CCG) – with its membership including all local GPs – co-commissioning GP services. The biggest concern was about conflicts of interest. GPs locally are voting on the proposal to co-commission primary care. Other concerns raised included the effects of GPs working in clusters and changes affecting community and hospital care. Two members of the group – Katrina Miller and Dave Baker – appeared on The Vote, the politics and current affairs programme on Latest TV to discuss issues raised at the meeting last Thursday (24 September).